Line baking sheet with foil. Brush salmon with oil and season with salt and pepper. Bake for 10 minutes, or until the center is opaque in the center, about 10 minutes. While the fish is cooking make the Pineapple Ginger Relish: Heat 1 Tablespoon olive oil in a medium size sauté pan over medium-high heat. Add red onion, red bell pepper and edamame. Sauté until tender. Add corn, black beans and garlic and sauté an additional 2-4 minutes. Add Pineapple Ginger Sauce and heat. Transfer salmon to a platter. 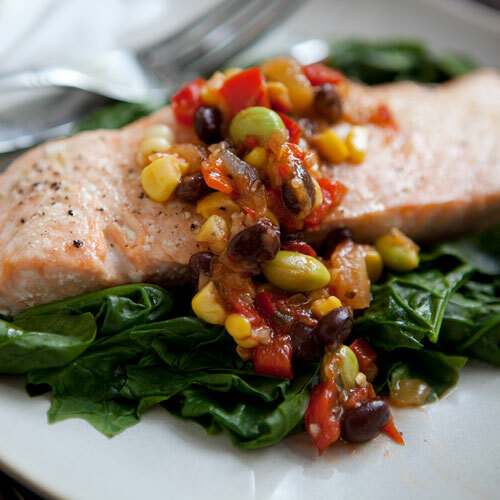 Spoon relish over salmon and serve.